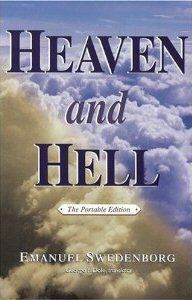 Heaven and Hell by Emanuel Swedenborg. Swedenborg was a Swedish scientist an inventor. I would compare his drawings of flying machines to the ones of Leonardo da Vinci‘s . In 1741 at the age of fifty-three he entered into a spiritual phase in which he eventually began to experience dreams and visions. This culminated in a spiritual awakening, where he claimed he was appointed by the Lord to write a heavenly doctrine to reform Christianity. He claimed that the Lord had opened his eyes, so that from then on he could freely visit heaven and hell, and talk with angels, demons and other spirits. For the remaining 28 years of his life, he wrote and published 18 theological works, of which the best known was Heaven and Hell. Emanuel Swedenborg claimed that the Lord had opened his eyes, so that from then on he could freely visit heaven and hell, and talk with angels, demons and other spirits. Christ did not found the Catholic church. For the Lord would not found any church in which its believer worship and pray to women and men who were believers (called ‘saints’). Nor did establish His church among those who handed him over to those who wished to crucify Him, for He did not preach the gospel to the Romans but rather to the Jews. It was given to the Jews who were his apostles who preached it first to other Jews, then by Paul to the gentiles, so it is fictitious and silly to believe that Christ ‘gave’ His church to the Romans. Silly child, would Christ establish his church among those who killed His people by the thousands? Then the power of his forgiveness to those who steal His divinity? Didn’t the Jews wish to cast the Lord out of their temple for forgiving the man with the withered hand of his sins because as they said ‘only God can forgive sins’? If therefore the Jews (who did not acknowledge that the Lord Jesus was very God in the flesh knew that only God can forgive sins how do catholics dare to say that a pope has this same right? What blindness on their part, and worse it is theft against the Lord of His Divine Power which is His alone for He alone is the Redeemer who thus by right has power to forgive sins, for HE made the sacrifice NOT the POPES. Those who say that the Catholic church is even a church do not know the truth. The catholic church is the great harlot Babylon who has laied in a bed of lies of doctrines of men and is cast down and put to shame in the sight the angels. The Lord warns “Come out of her, do not take part in her sins.” Amen. As for Swedenborg, he spoke volumes more sensibly than all of the sermons of today’s respected preachers. Not one of the disciples was a religious leader, and the one religious leader whom we know Jesus spoke with was more blind than any of the twelve apostles. Swedenborg never was a religious leader but he makes more sense in his expositions than any who preached a sermon on doctrine whom ever I encountered, and I have heard my fair share of sermons,I’ll tell you!